bl.uk > Online Gallery Home	> Online exhibitions	> Asia, Pacific and Africa Collections	> The Mahratta Peshwa, and his ministers at Poonah. Drawn from an original sketch belonging to Sir Charles Malet Bart. Plate forty-two from the second volume of James Forbes' "Oriental Memoirs". Charles Malet (1752-1815), the Resident of Poona was a close contemporary and a good friend of Forbes. 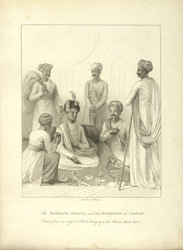 Forbes' (1749-1819) drawing was based on an original sketch made by the English artist James Wales for Malet showing the brahmin Maratha ruler, Peshwa Madho Narain with his ministers.